NAIROBI, Kenya, September 21, 2010 (ENS) – Rhinos and other wildlife in Kenya’s world-famous Lake Nakuru National Park will be better protected with funds raised by cyclists this weekend during the sixth annual Cycle with the Rhino race. 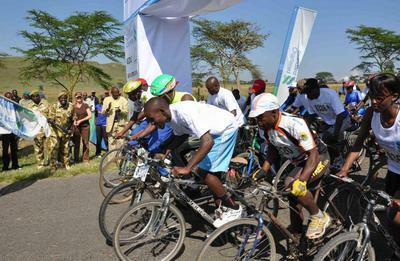 Flagged off by Minister for Forestry and Wildlife Dr. Noah Wekesa, 57 adult cyclists sped down the 64-kilometer (40 mile) route within the park, through the neighboring community and through Nakuru Town. Sponsored by Kenyan businesses and WWF, the global conservation organization, the cyclists raised Sh7.5 million (US$92,535) during Saturday’s race. The top winners were sponsored by Standard Chartered Bank, the event’s lead sponsor. Other key sponsors included Safaricom, Kenya Commercial Bank, Gilgil Telecommunications, Kenya Airways, Geothermal Development Corporation, and UUNet. The adults’ race was won by Samwel Mwangi, 26, followed by John Njoroge, 25, while third place was taken by Suleiman Kangangi, 21. The first woman cyclist was Seline Atieno, 25, sponsored by Lake Lodge. For the first time, this year’s race had categories for children and juniors as well as adults. The funds raised will be used for the rehabilitation of the baboon-proof electric fence around the park and to implement community conservation projects that protect black rhinos, Rothschild giraffes and the lake’s famed flocks of pink flamingoes. 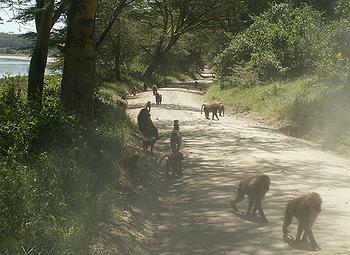 Since the cycling event was started in 2003, 18 km of the 74 km baboon-proof fence has been rehabilitated. Speaking at the event, Dr. Wekesa said Kenyans are facing the adverse effects of climate change, including prolonged drought and extended rains. He called on Kenyans to conserve the environment as a way of mitigating some of these effects. Kenya Wildlife Service Director Julius Kipng’etich said Nakuru town has great potential to emerge as a tourism hub, besides being the traditional agricultural hub for Kenya. He pledged KWS support for the development of tourism potential in newly-created counties. Kipng’etich told the crowd that human wildlife conflict and road crashes on the Nairobi-Nakuru highway have dropped since a 10-km fence was erected two months ago by the Kenya Wildlife Service in partnership with Soysambu Conservancy. Kenya Wildlife Service is negotiating with various conservancies to create wildlife corridor between Lake Nakuru and Lake Naivasha, Kipngetich said, adding that the park’s 4,000 buffalos have exceeded its carrying capacity and require more space. Kipng’etich commended Minister Wekesa for recently gazetting Lake Elementeita, laying the groundwork for it to be declared a UNESCO World Heritage Site. He explained that Lake Nakuru’s National Park is threatened by the increasing urbanization, pollution, land degradation, decrease in quality and quantity of water in the lake and loss of biodiversity as a result of deforestation in the Mau, Eburu and Bahati forests. Research has shown there is a danger of losing this important ecosystem within the next eight years, if matters remain the same, he warned. Cycle with a Rhino is one of the initiatives that has been developed to curb the degradation of this ecosystem. Conceptualized in 2003, the fun-filled cycling race aims to raise the funds to rehabilitate the park’s 74-km (46 mile) baboon-proof electric fence and undertake community conservation education around the environmentally fragile park. Kenya Wildlife Service spokesman Paul Udoto says the baboon-proof electric fence is important because the baboons are one of the greatest culprits in human wildlife conflict with communities living adjacent to the park. 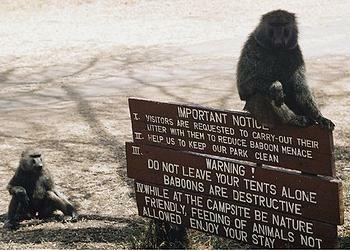 “When the baboons stray from the national park, they interfere with children learning in schools neighboring the park,” Udoto said. 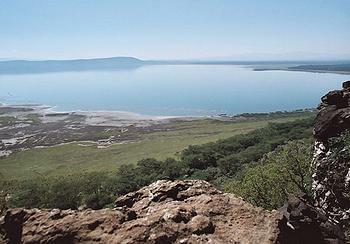 Lake Nakuru is an urban park. Nakuru Town is the fourth largest town in Kenya after Nairobi, Mombasa and Kisumu. At the moment, it’s one of the fastest growing towns in the country. Yet the park boundaries are barely five kilometers (three miles) from the Nakuru Town Centre, so the park is surrounded by a fast-growing human population with all the pressures that come with human settlements and industries. Lake Nakuru National Park was designated a bird sanctuary in 1961, extended to 63 square kilometers (24 square miles) in 1968. The park was extended to its current size of 188 sq km (72.5 square miles) in 1974 through funding from the WWF. To combat rising poaching, it was established as Kenya’s first state-managed rhino sanctuary in 1984. The park’s chain link fence was erected in 1976 and the electric fence in 1987. To safeguard migratory waterfowl, in 1990 the park was declared a protected wetland of international importance under the Ramsar Convention. In 2005, the park was branded as a Bird watcher’s Paradise, famous for its display of over 1.5 million flamingos.